The modernization programmes of customs authorities around the world have the objective of improving the effectiveness of all systems operated by customs to fulfill its role in the collection of revenues. A common theme of such programmes is the movement away from paper based systems towards electronic systems; in the case of Customs functions this should eventually support long term objectives like One Stop Border Posts and Green Lanes. In the shorter term the management of transit goods represents a specific problem area to be targeted for improvement. Administering large numbers of transactions (largely paper based) in an audit context. Customs transit is a very important procedure for all customs authorities, both domestically and regionally. The regional context is especially relevant in the African context, as most sea ports serve as ports of entry and exit for landlocked countries. The implementation of an effective system for the management of transit goods will not only address an area where significant revenue losses are suspected to occur – it can also serve as benchmark for future systems to be applied to control the movement of all goods, facilitating the process for the implementation of One Stop Border Posts and Green Customs Lanes. A variety of technologies are currently available to help address the problems as outlined above. Careful consideration should however be applied before a decision is taken regarding the optimal choice of technologies to be deployed. The best option to be deployed will depend not only on technical functionality, but more importantly on suitability for the specific need as well as total cost of deployment and operation. In this section an overview is provided of the most prominent candidate technologies that should be considered as part of an overall solution. The use of satellite tracking systems, both for theft prevention (i.e. vehicle recovery) as well as for logistics management, is already commonplace around the globe. For the application of this technology to freight tracking, the solution will consist of a satellite tracking unit fixed to each item to be tracked (e.g. trucks and containers), using existing satellites both for location fixing (the GPS portion of the solution) as well as for communication with a base station. It is also possible to use a unit that can support both satellite and GSM/GPRS communication, as this is normally a cheaper alternative in terms of communication costs, to be used in areas with GSM/GPRS coverage. In addition such units can support additional sensing devices, e.g. intrusion or temperature sensing. At the base station a software application will provide tracking information on a 24/7 basis, showing the location of each tagged item on a GIS (geographical information systems) map, and highlighting items that have deviated from planned routes. 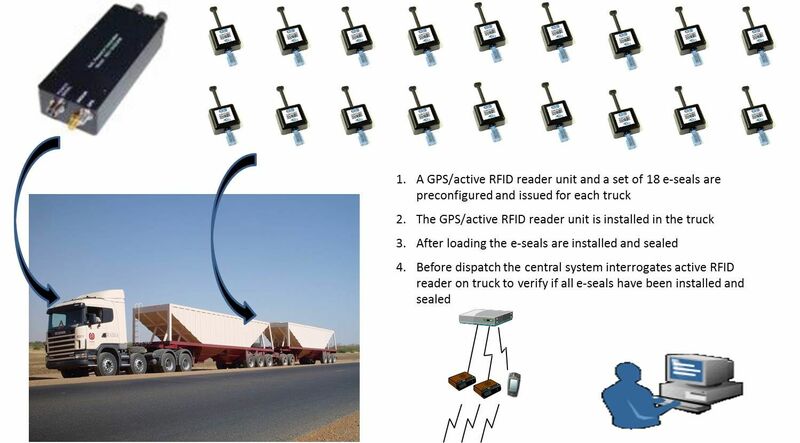 The active RFID portion of the solution will consist of an active transponder attached to each item to be tracked (typically trucks and containers) with active readers installed inside the trucks and linked to the GPS/GPRS devices, and/or permanently installed at locations where the presence of the tagged items must be detected. It will offer tracking over distances of around 100m between transponder and reader, although this can vary substantially depending on the physical surroundings. It therefore offers 24/7 tracking plus spotting of tagged items when the item passes close enough to a fixed reader. The number of readers per site will depend on the size of the area to be covered as well as on the nature of obstructions that are present (e.g. buildings). Active RFID tags are battery powered and can also accommodate additional sensing devices (e.g. intrusion detection). The next logical technology option to consider is passive RFID. As for active RFID, it provides spotting rather than continuous tracking information, with the read range between transponder and reader limited to a distance of about 3 – 10 m, depending on the type of reader and its orientation with respect to the transponder. As in the case of active RFID, all tagged items will be equipped with a transponder, while readers will be installed at position where items must be detected, typically at a customs gate. Passive transponders carry no battery, and only become alive when passing close enough to a reader – it is therefore not possible to continuously store data from additional sensors, e.g. when an intrusion event occurred. This information will only become known when the transponder is read for the first time subsequent to such an event. Transponders can be read manually using handheld readers or automatically using lane readers – it is therefore possible to accommodate either manually controlled or fully automated detection of the status of consignments. The management of transit goods under suspense regarding the payment of customs and duties has been identified by many customs authorities as a problem area that requires the support of improved systems. 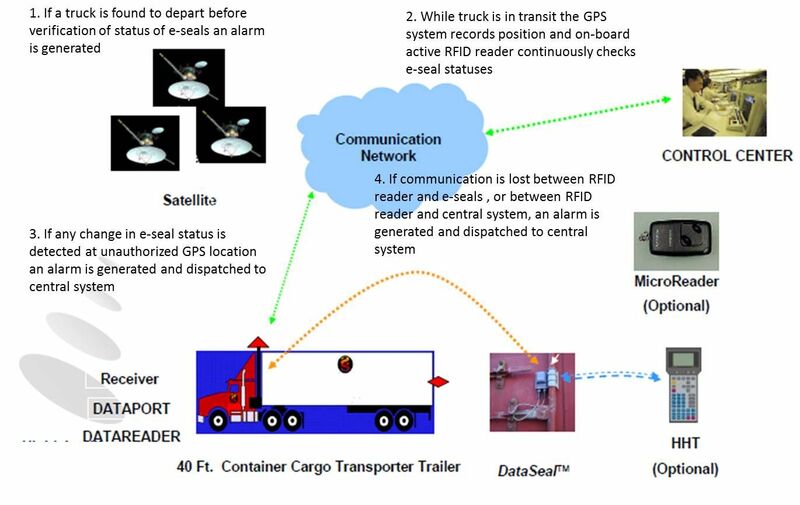 This article describes currently available technology in the form of GPS/GPRS tracking and RFID and electronic seals to be applied to transit goods moving from ports into neighboring countries, with the aim of improving control over the acquittal status of such goods. Therefore a transit system enabled by e-seals can be a cost effective and suitable solution for use within the cross-border operational environment. 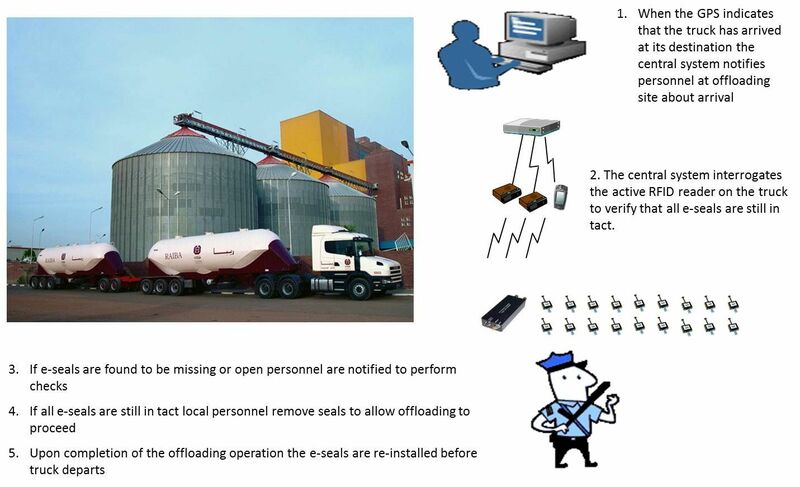 The outcomes that can be achieved from the implementation of such a system include real time verification of the current acquittal status of transit goods, 100% accuracy in the eventual acquittal of such goods, and the generation of evidence to assist prosecution in the case of transgressions. While GPS/GPRS assisted by active RFID offer the benefit of real-time tracking, solutions based on passive RFID is differentiated by the use of low-cost electronic seals and electronic tags to secure and identify transit goods. Additionally, a passive RFID system is easy to implement, simple to run, and offers a cost effective approach relative to the technology alternatives, both in terms of capital expenditure required to be installed at key ports of entry, and subsequently exceptionally low variable costs of application (per seal or tag). Apart from customs authorities it is believed that a wider spectrum of stakeholders will benefit from the visibility and security features of the system as discussed; such stakeholders include the roads authorities, police services as well as cargo owners, freight forwarders and shipping lines. One possibility to facilitate future expansions of a customs transit system to incorporate the needs of other stake-holders would be the creation of Public-Private Partnerships that can offer a comprehensive service to both public and private players in this sector, covering complete trade corridors end to end.